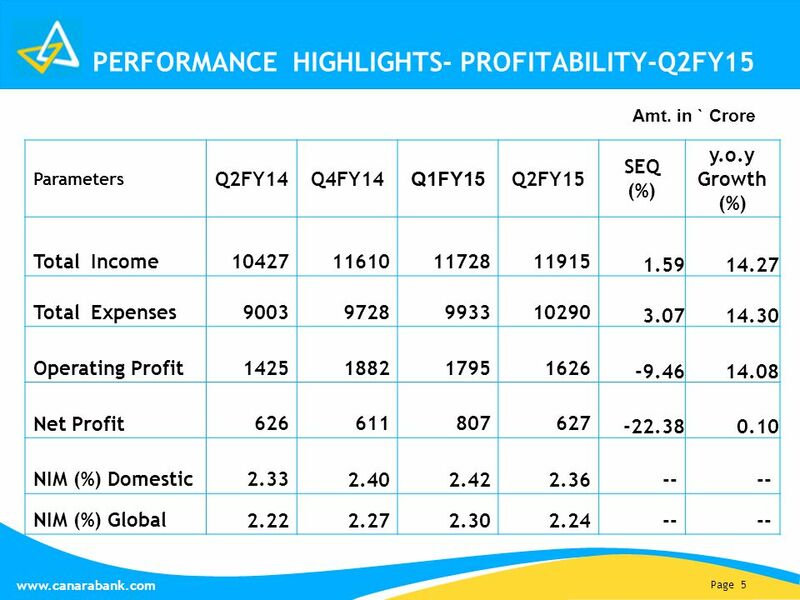 Page 1 www.canarabank.com PERFORMANCE HIGHLIGHTS SEPTEMBER 2014. 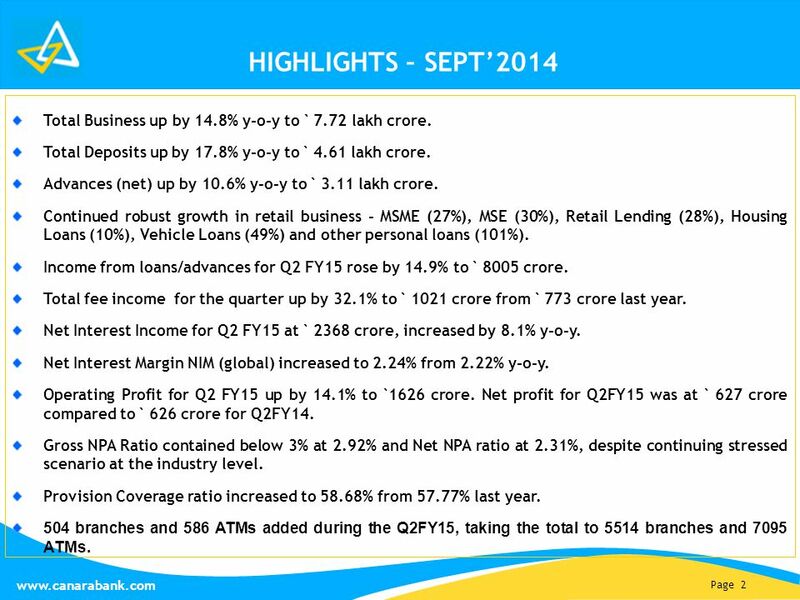 2 Page 2 www.canarabank.com HIGHLIGHTS – SEPT’2014 Total Business up by 14.8% y-o-y to ` 7.72 lakh crore. 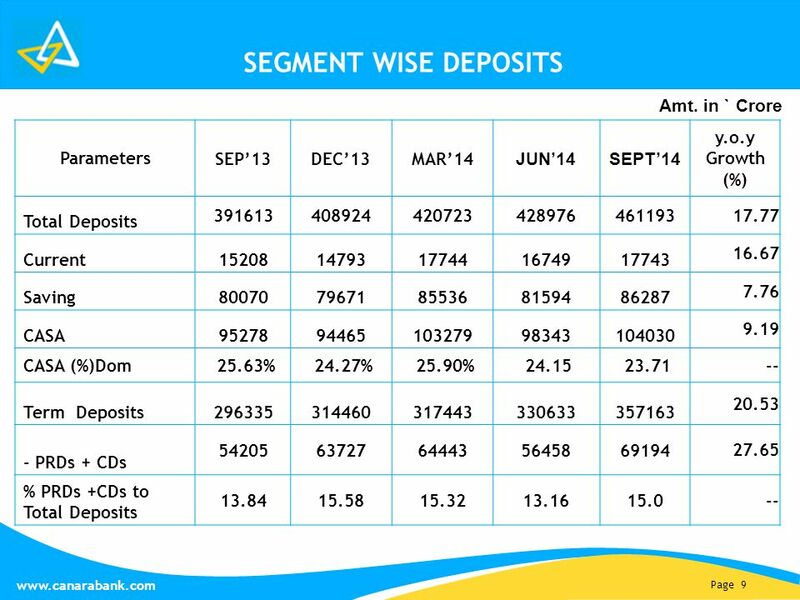 Total Deposits up by 17.8% y-o-y to ` 4.61 lakh crore. 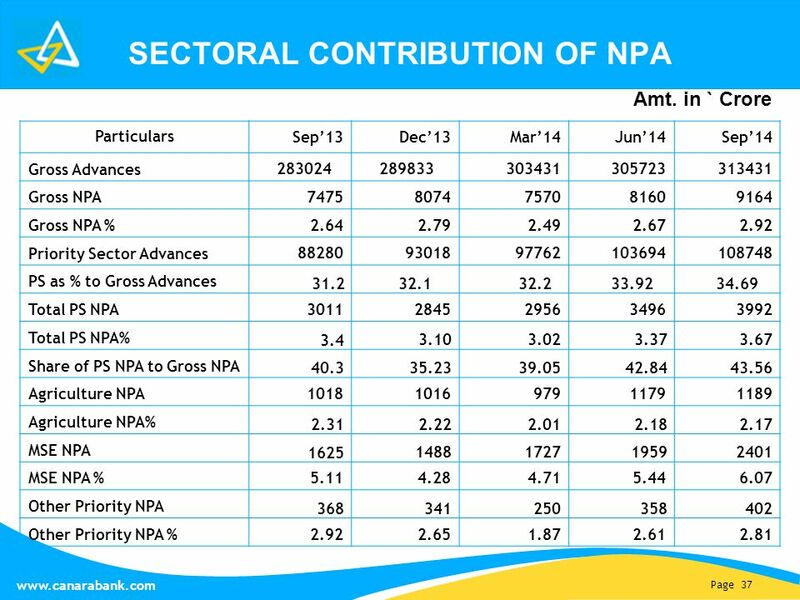 Advances (net) up by 10.6% y-o-y to ` 3.11 lakh crore. 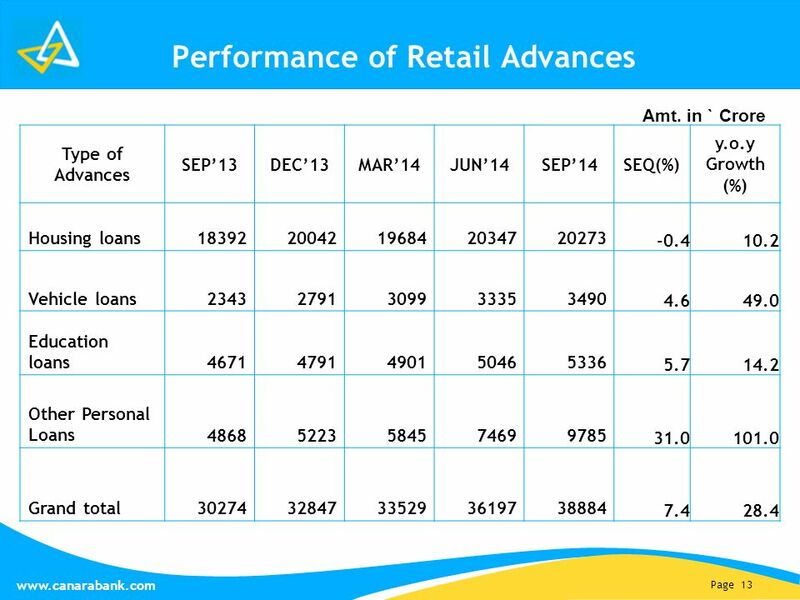 Continued robust growth in retail business - MSME (27%), MSE (30%), Retail Lending (28%), Housing Loans (10%), Vehicle Loans (49%) and other personal loans (101%). 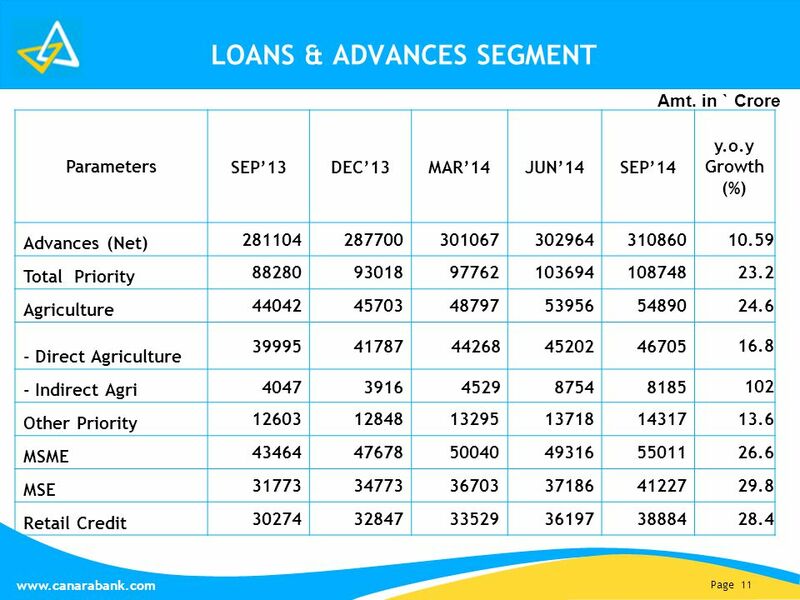 Income from loans/advances for Q2 FY15 rose by 14.9% to ` 8005 crore. 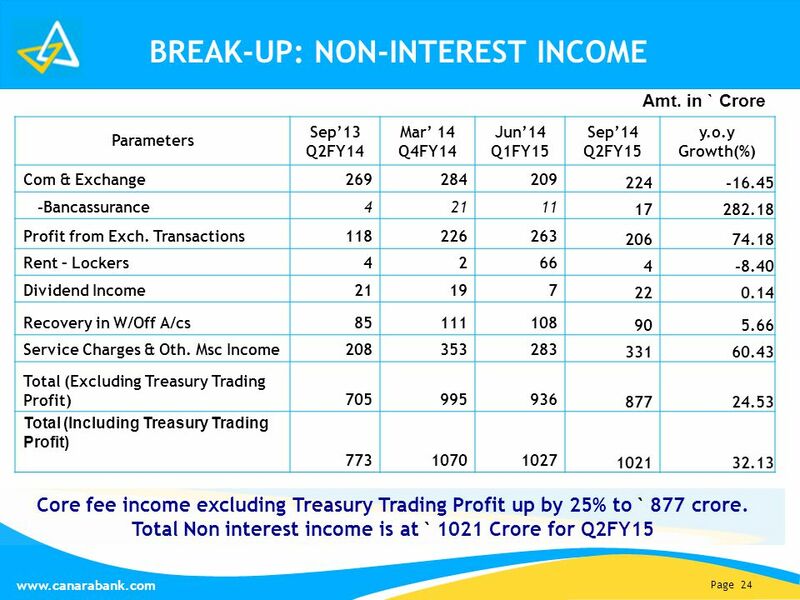 Total fee income for the quarter up by 32.1% to ` 1021 crore from ` 773 crore last year. 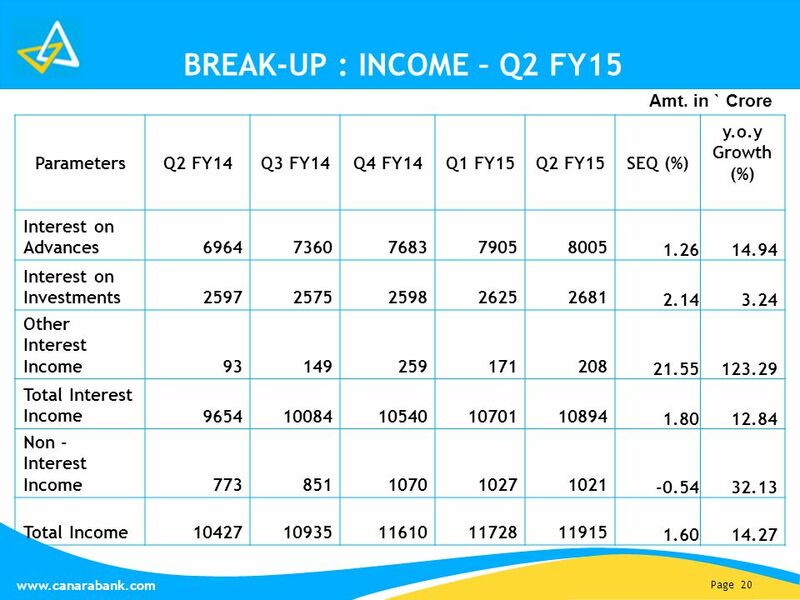 Net Interest Income for Q2 FY15 at ` 2368 crore, increased by 8.1% y-o-y. 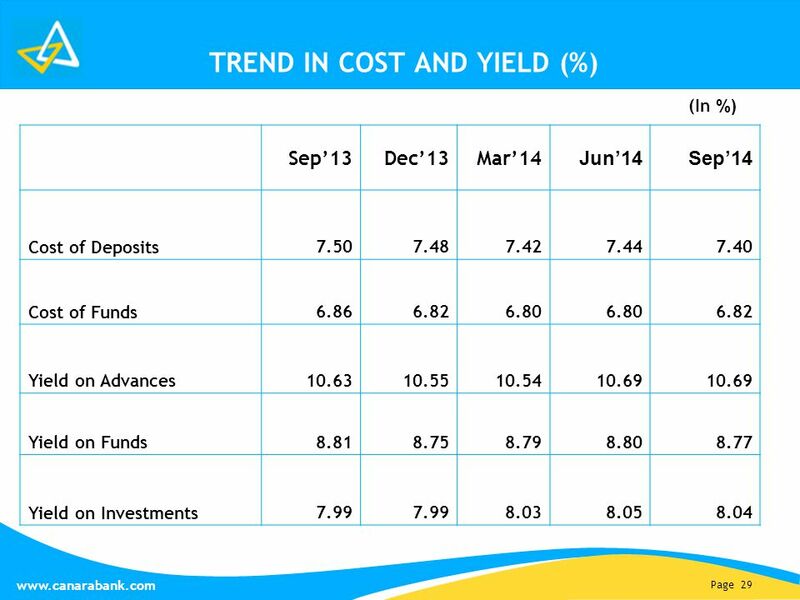 Net Interest Margin NIM (global) increased to 2.24% from 2.22% y-o-y. 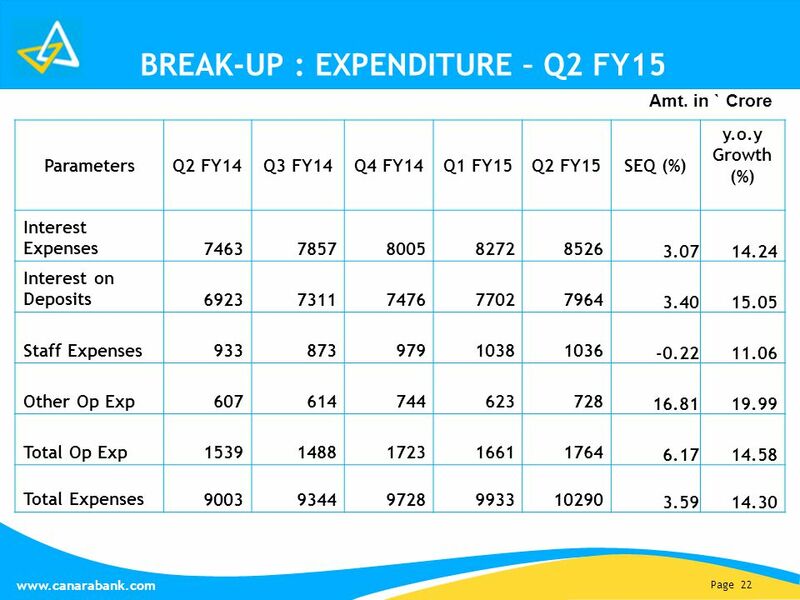 Operating Profit for Q2 FY15 up by 14.1% to ` 1626 crore. 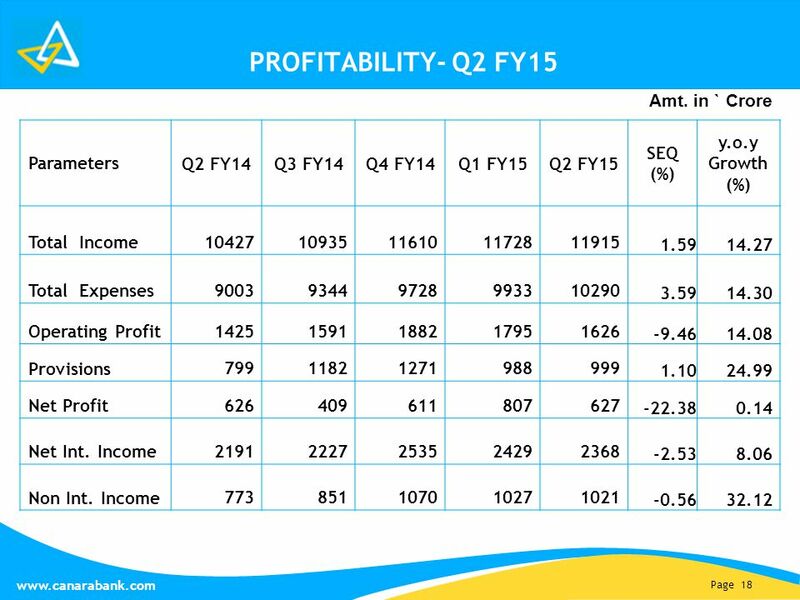 Net profit for Q2FY15 was at ` 627 crore compared to ` 626 crore for Q2FY14. 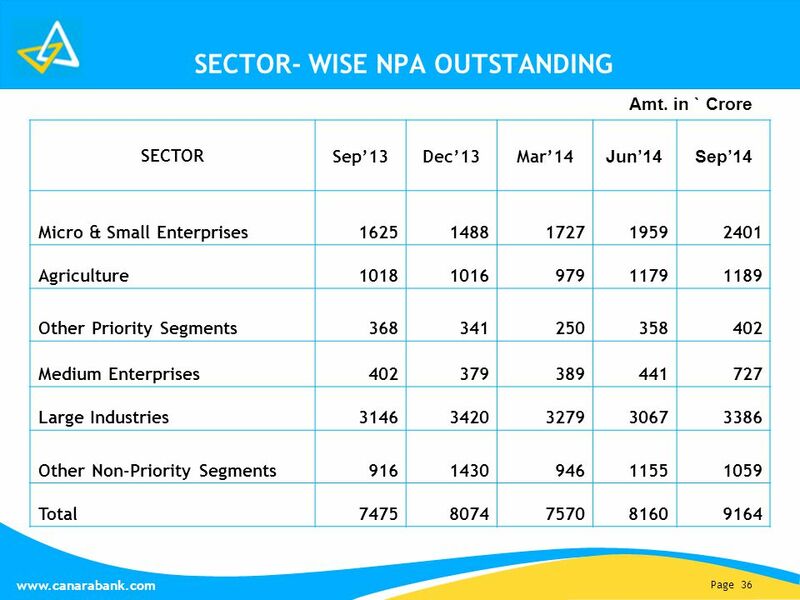 Gross NPA Ratio contained below 3% at 2.92% and Net NPA ratio at 2.31%, despite continuing stressed scenario at the industry level. 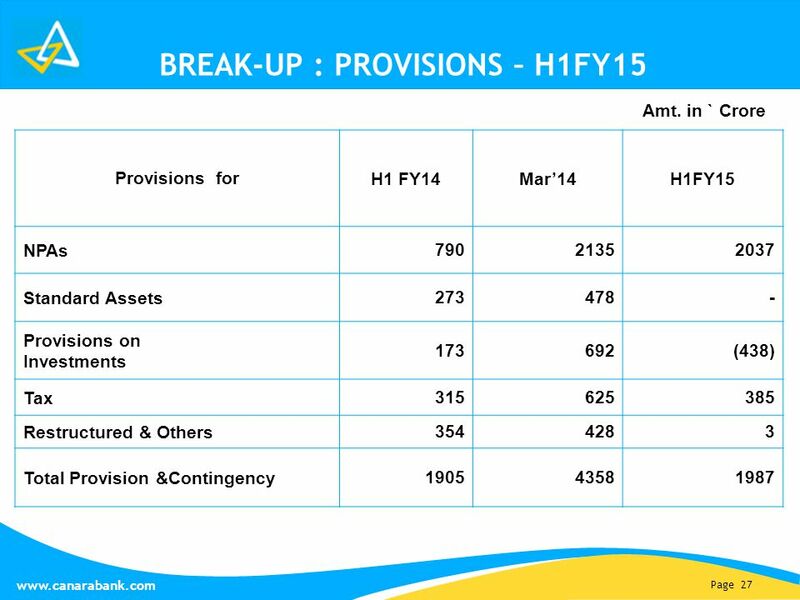 Provision Coverage ratio increased to 58.68% from 57.77% last year. 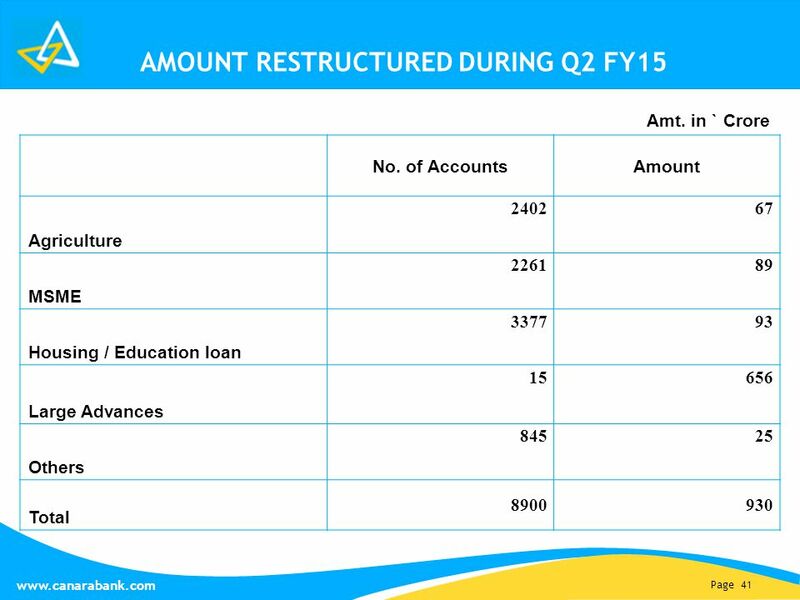 504 branches and 586 ATMs added during the Q2FY15, taking the total to 5514 branches and 7095 ATMs. 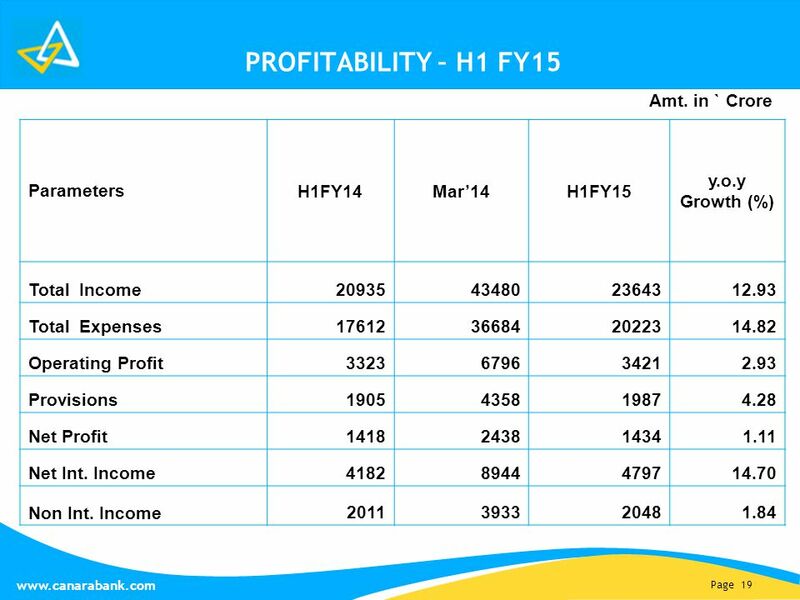 3 Page 3 www.canarabank.com PERFORMANCE HIGHLIGHTS- BUSINESS Parameters SEP’13Dec’13MAR’14 JUNE’14SEP’14 SEQ (%) y.o.y Growth (%) Deposits391613408924420723428976461193 7.5117.77 Advances (net) 281104287700301067302964310860 2.6110.59 Business672717696624721790731940772053 5.4814.77 C-D Ratio71.7870.3671.5670.6267.40 -- Amt. 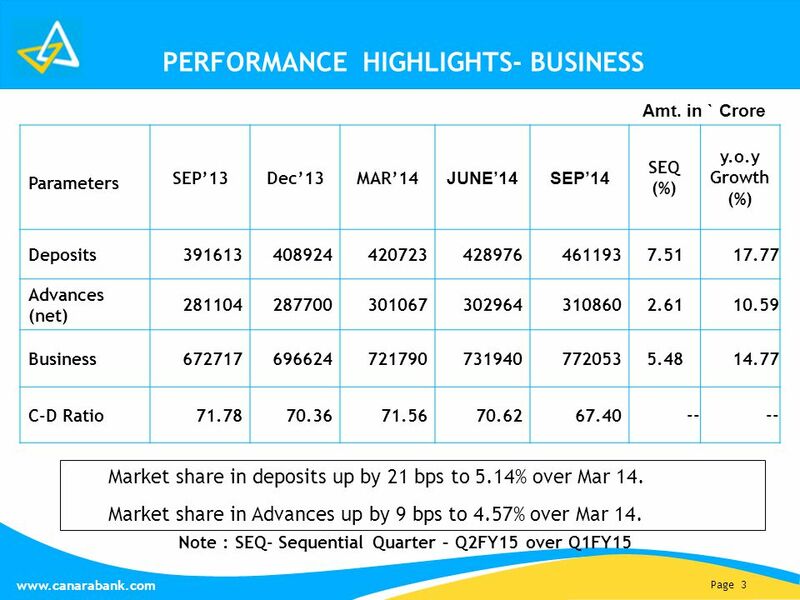 in ` Crore Note : SEQ- Sequential Quarter – Q2FY15 over Q1FY15 Market share in deposits up by 21 bps to 5.14% over Mar 14. 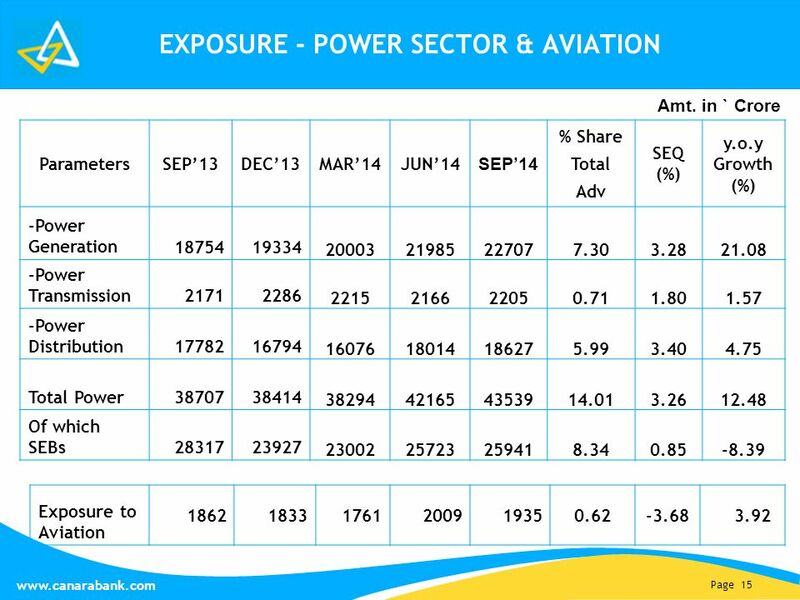 Market share in Advances up by 9 bps to 4.57% over Mar 14. 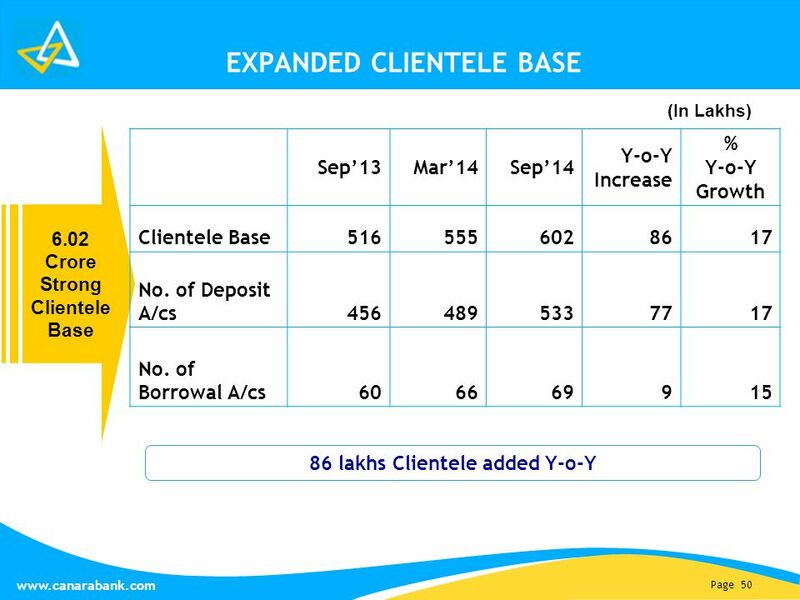 48 Page 48 www.canarabank.com IMPORTANT CUSTOMER-FRIENDLY TECHNOLOGY INITIATIVES  Five MSME Consultancy Services Centres e stablished for providing consultancy services to MSME clientele. 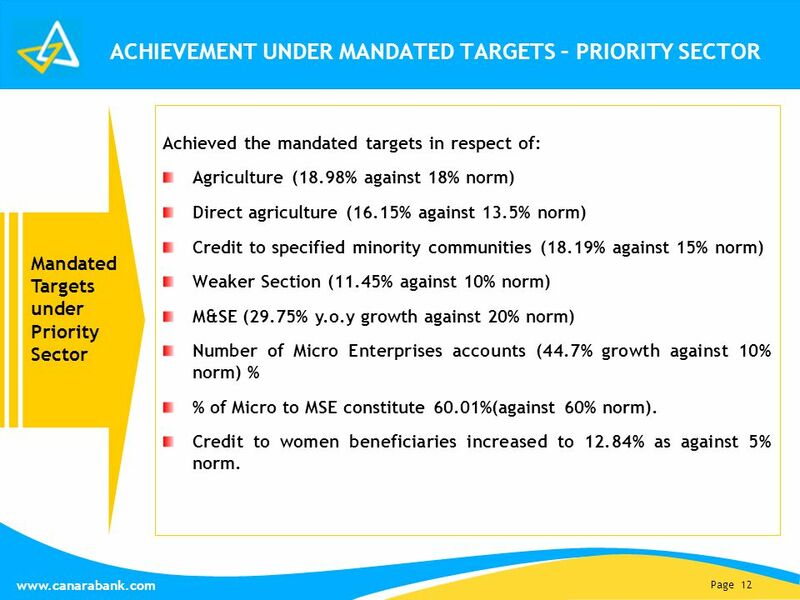  Introduced a new credit scoring model for evaluating the eligibility of MSME entrepreneurs to avail finance from banks, first of its kind in the industry. 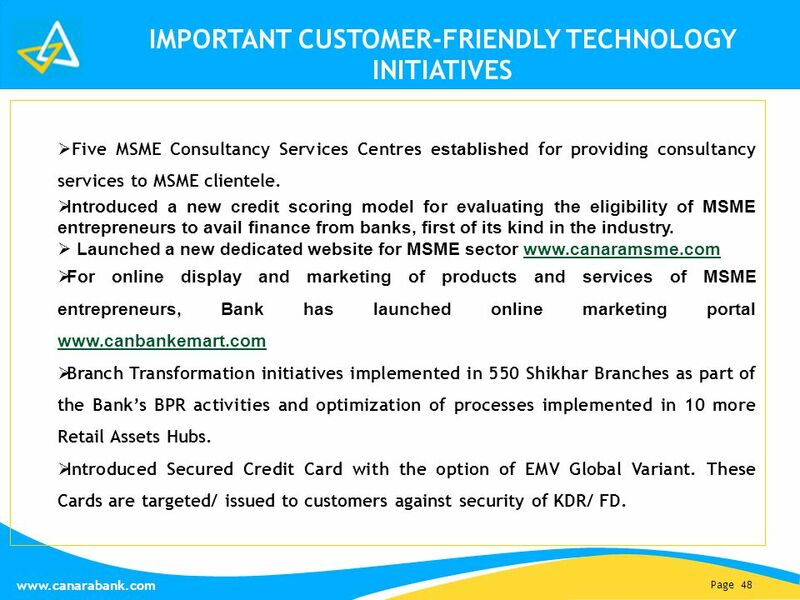  Launched a new dedicated website for MSME sector www.canaramsme.comwww.canaramsme.com  For online display and marketing of products and services of MSME entrepreneurs, Bank has launched online marketing portal www.canbankemart.com www.canbankemart.com  Branch Transformation initiatives implemented in 550 Shikhar Branches as part of the Bank’s BPR activities and optimization of processes implemented in 10 more Retail Assets Hubs. 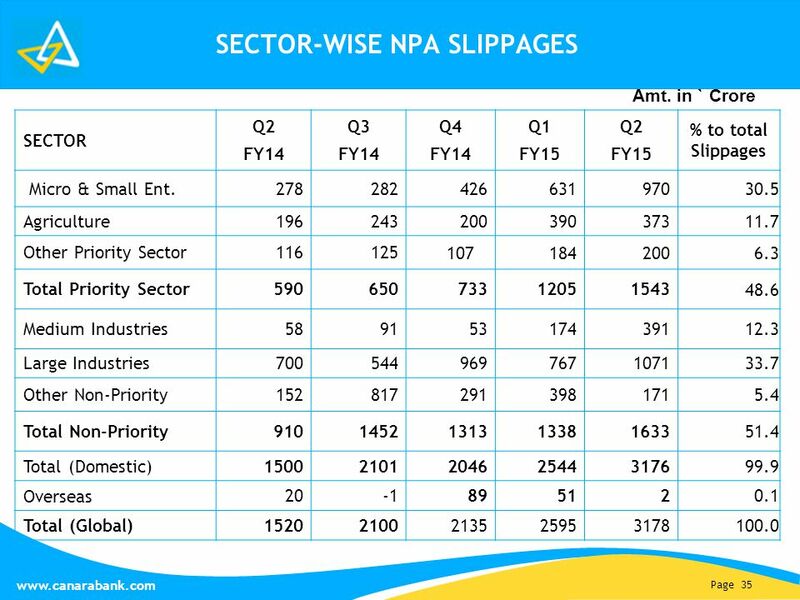  Introduced Secured Credit Card with the option of EMV Global Variant. 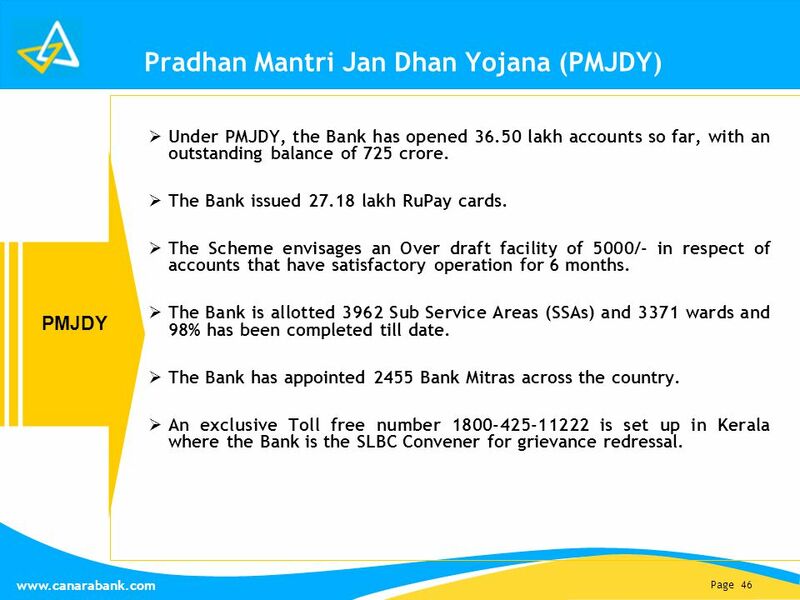 These Cards are targeted/ issued to customers against security of KDR/ FD. 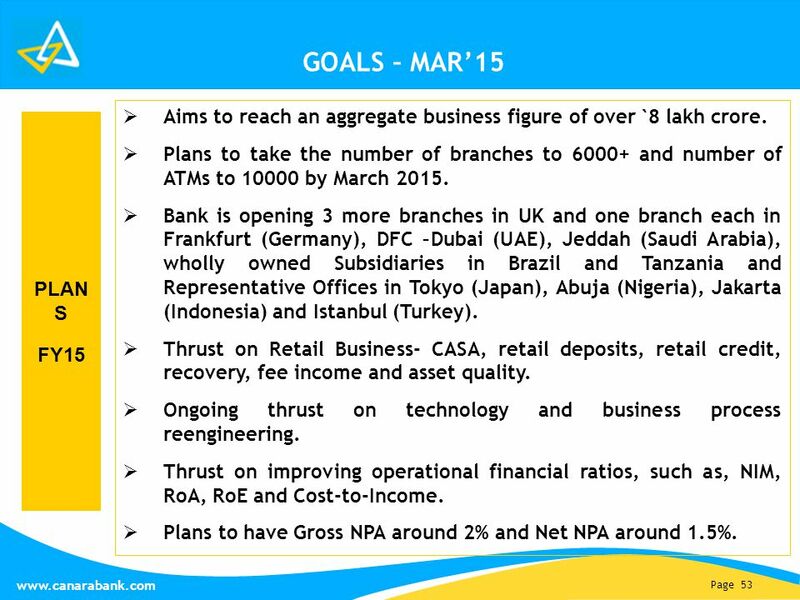 49 Page 49 www.canarabank.com IMPORTANT CUSTOMER-FRIENDLY TECHNOLOGY INITIATIVES  Canara m-Wallet Mobile App released. 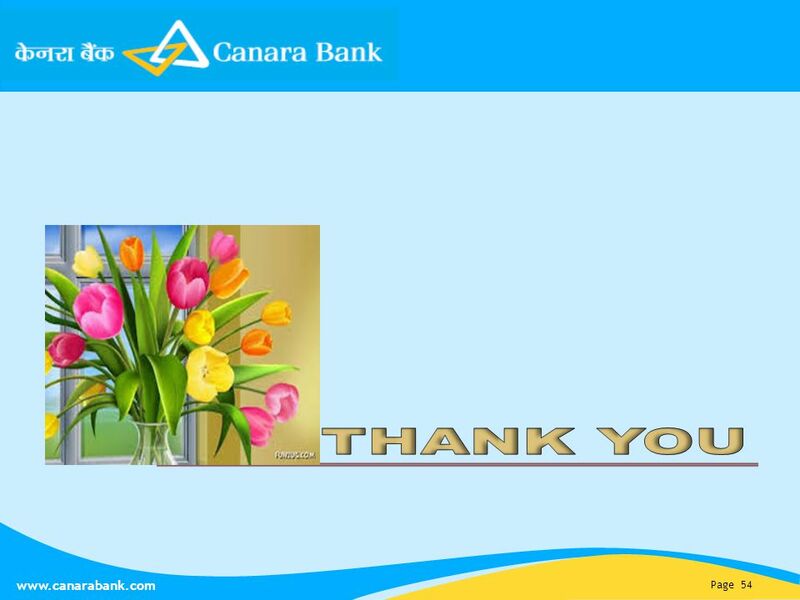  Canara easyCash Product released for cash transfer to migrant population.  Canara P-Serve (Touch Screen Kiosk Application) released. 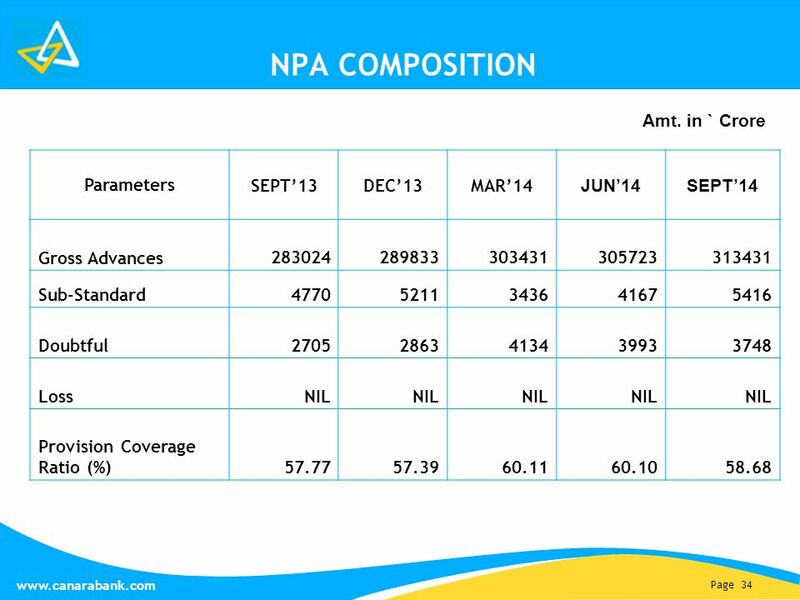  Mobile Banking through National Unified USSD Platform (NUUP) made available. 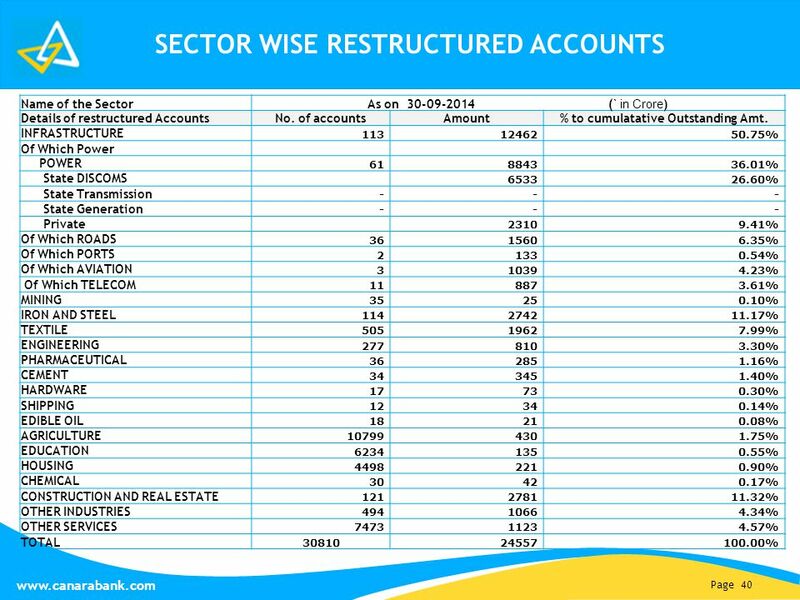  Online SB Account Opening Portal for NRIs released. 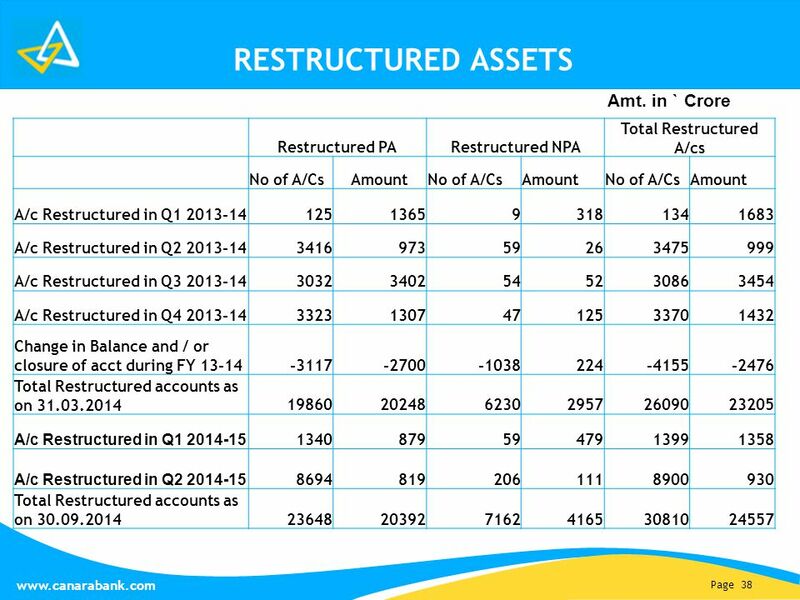  Treasury Collection Module for Government of Kerala released. 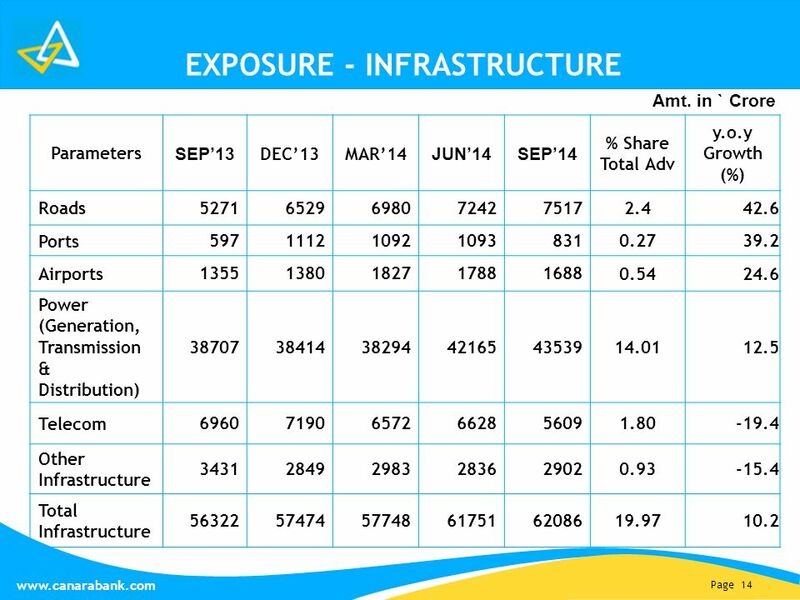  Commercial Taxes Collection application for Gujarat implemented. 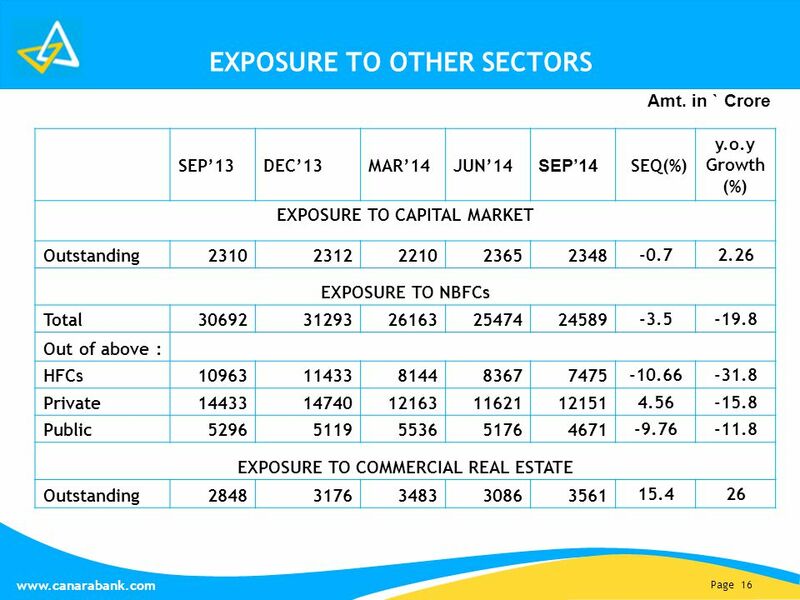  Export Data Processing and Monitoring System (EDPMS) Software for Treasury made live. 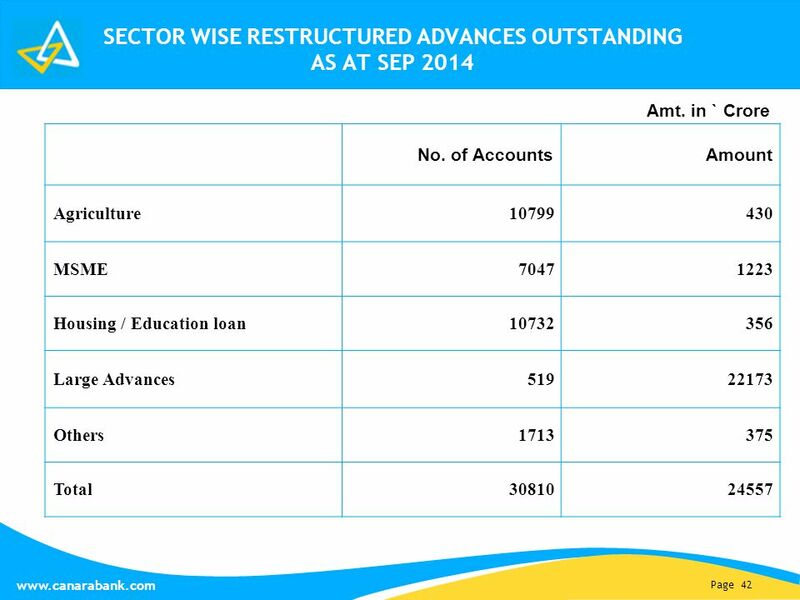  Sarva Shiksha Abhiyan Software (Fund Transfer from Central Government to School) for Andhra Pradesh completed. 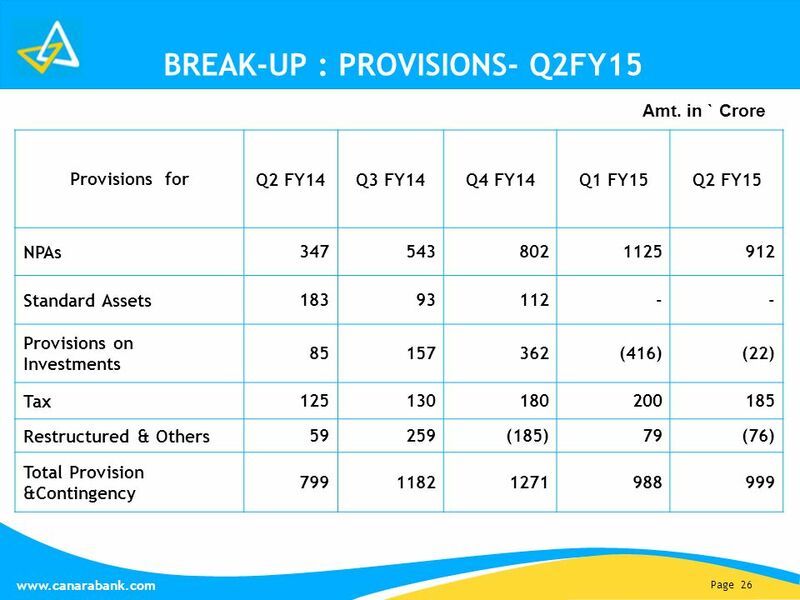 51 Page 51 www.canarabank.com MAJOR AWARDS/ACCOLADES IN Q2FY15 The Bank conferred with the following awards during the quarter in recognition of the varied initiatives. 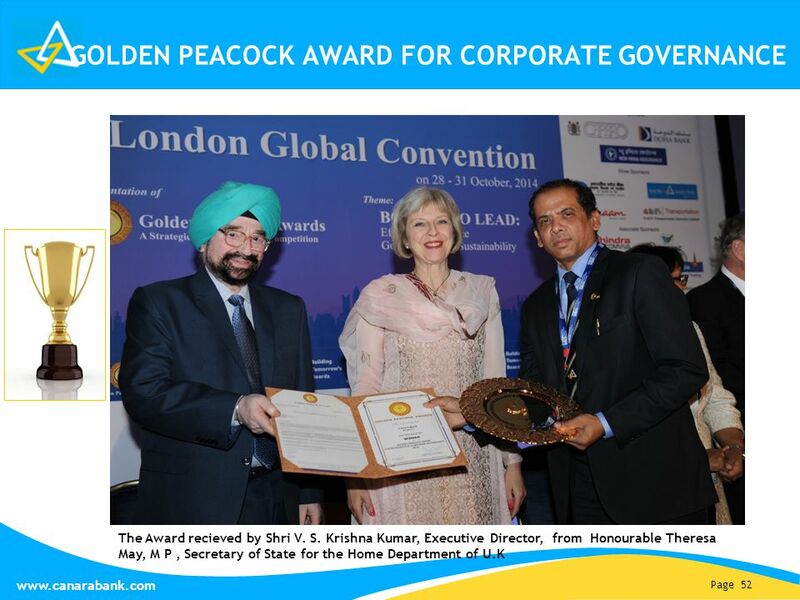  Golden Peacock Award for Corporate Governance by the Institutes of Directors, India. 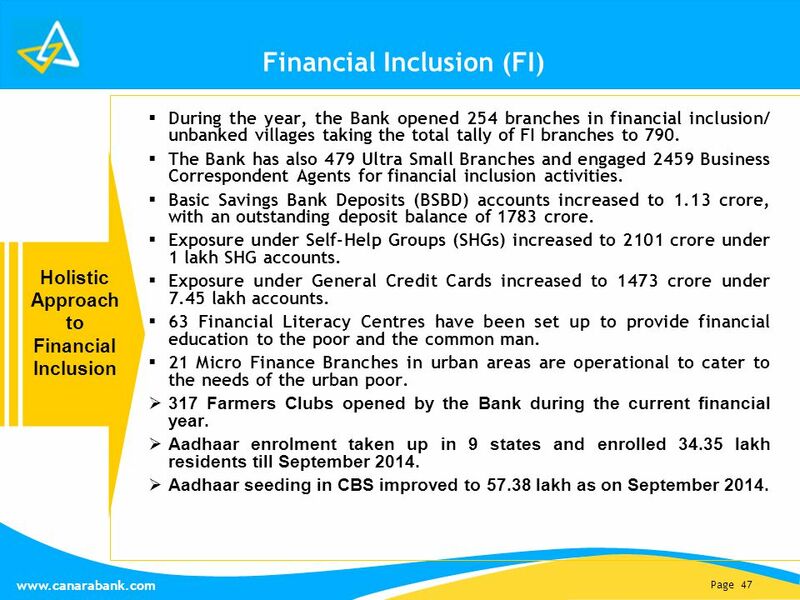  Assocham Social Banking Excellence Award 2014 under Public Sector Banks category for excellent performance under Corporate Social Responsibility initiatives.  CEO with HR Orientation at the Asia Pacific HRM Congress 2014 instituted by World HRD Congress. 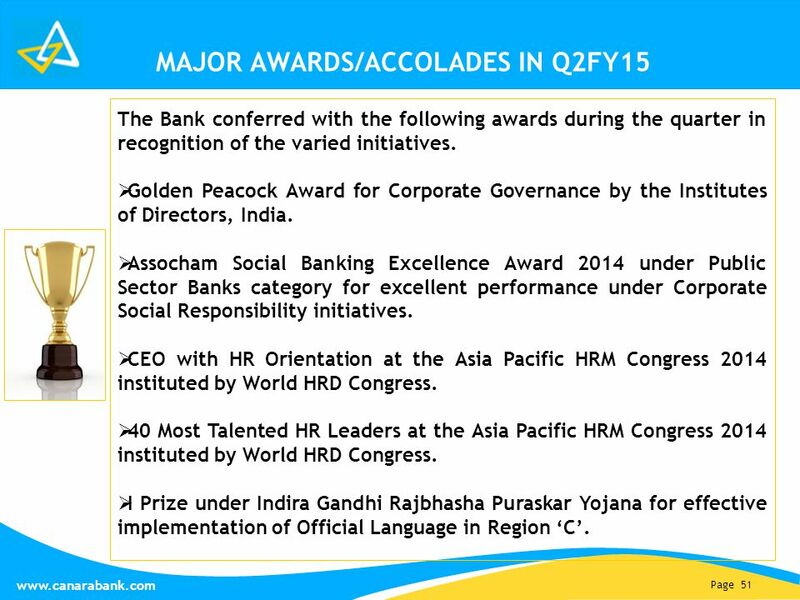  40 Most Talented HR Leaders at the Asia Pacific HRM Congress 2014 instituted by World HRD Congress.  I Prize under Indira Gandhi Rajbhasha Puraskar Yojana for effective implementation of Official Language in Region ‘C’. 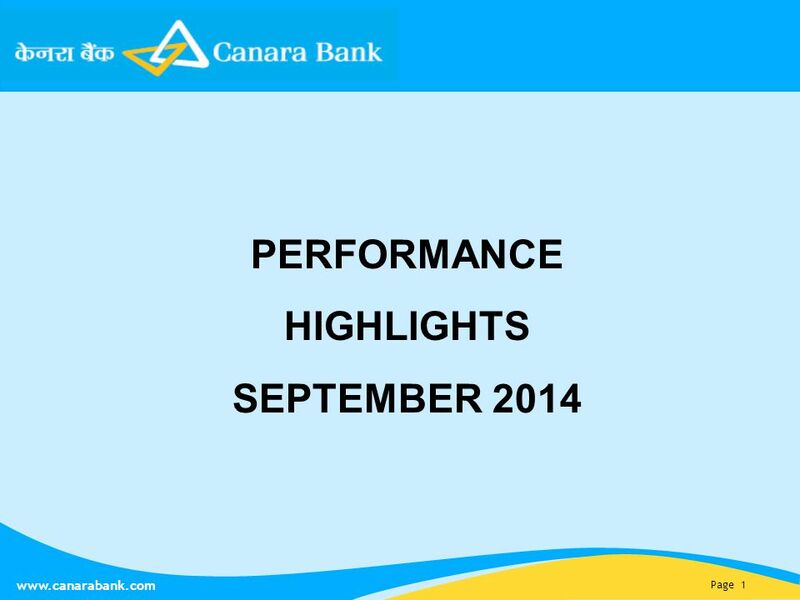 Download ppt "Page 1 www.canarabank.com PERFORMANCE HIGHLIGHTS SEPTEMBER 2014." 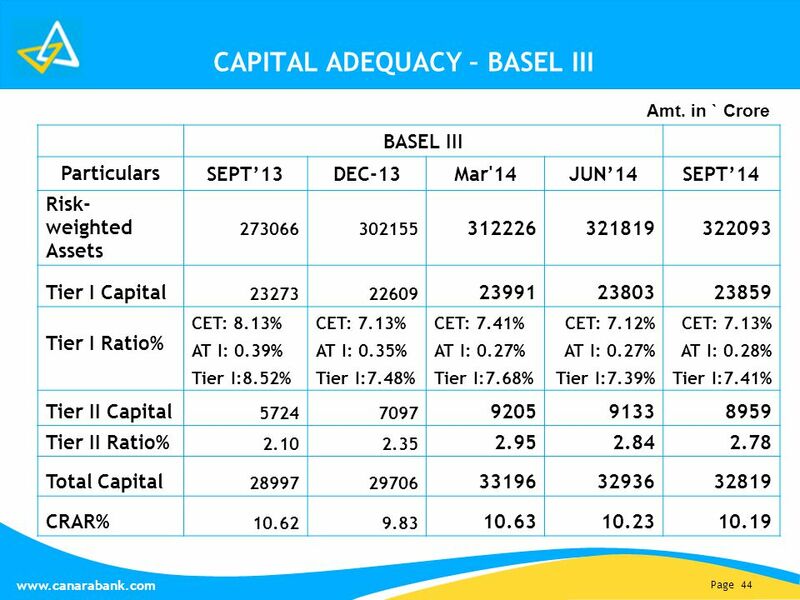 Page 1 PERFORMANCE HIGHLIGHTS JUNE 2013. 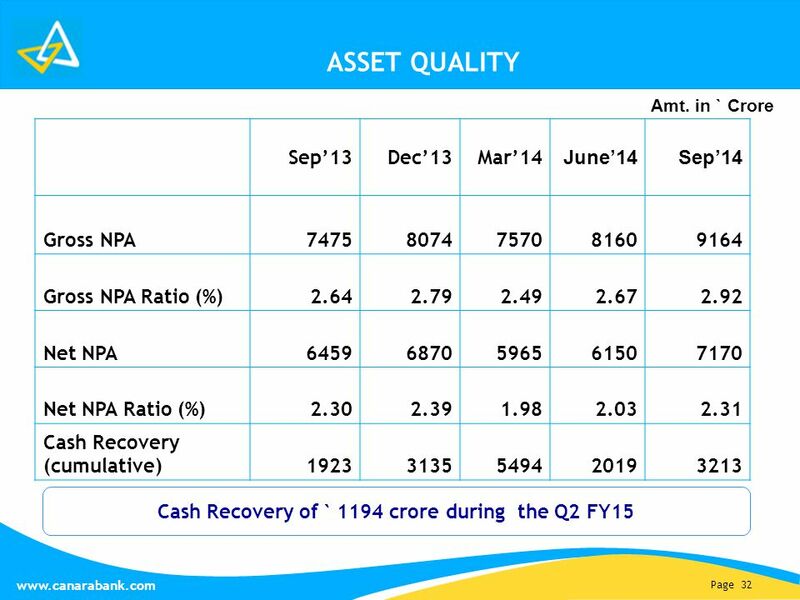 1126-Oct-091 Presentation on Performance during Q2 (2009 – 10) October 26, 2009. 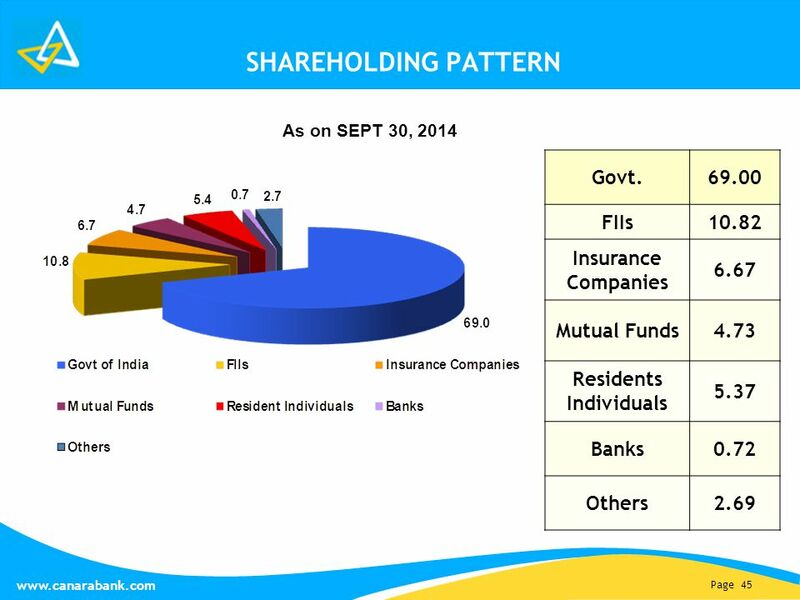 Annual Results FY THE BANKER TO EVERY INDIAN. 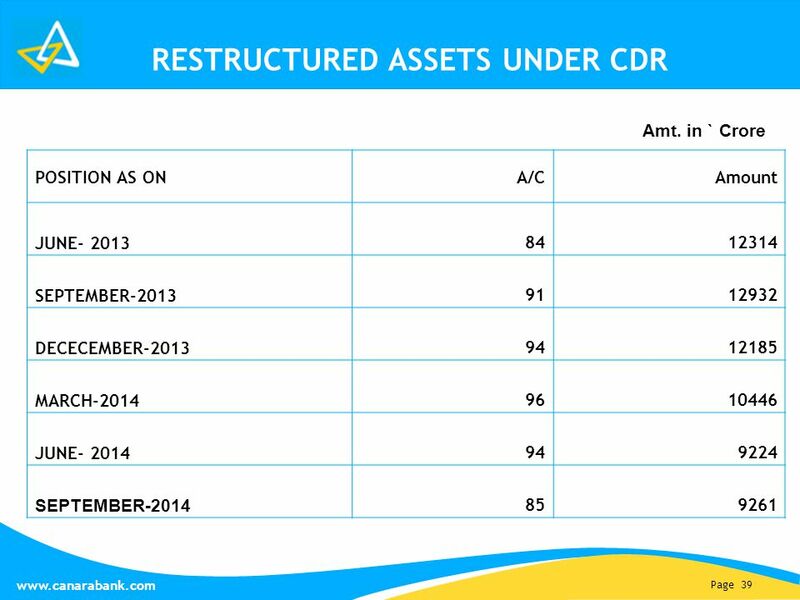 Performance Review: H1-FY02 October 25, Agenda Financial Overview Business Highlights. 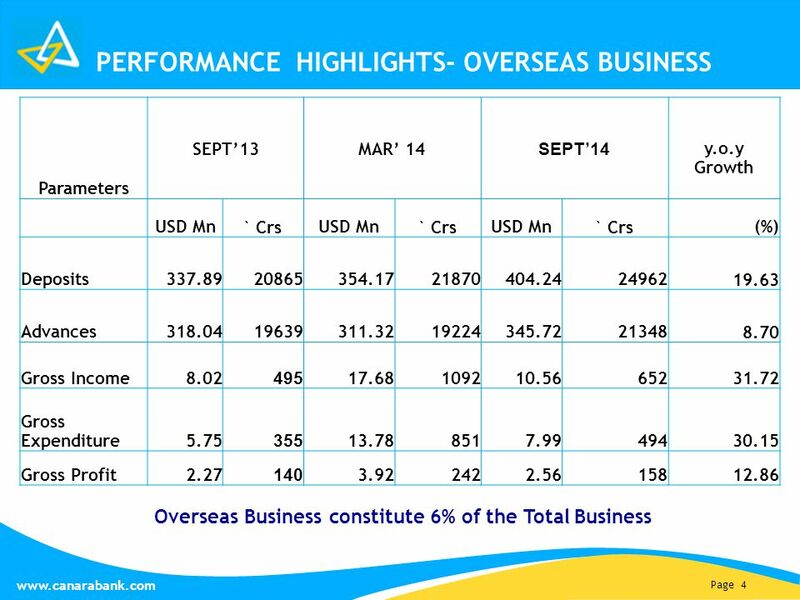 Page 1 PERFORMANCE HIGHLIGHTS SEPTEMBER 2013. 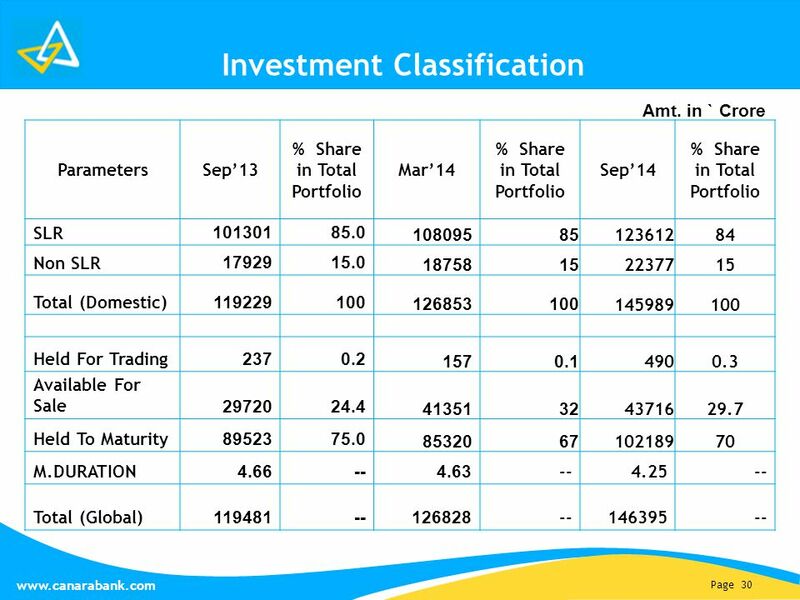 CANARA BANK Creating Value For Investors Brought to you by Bsplindia.com. 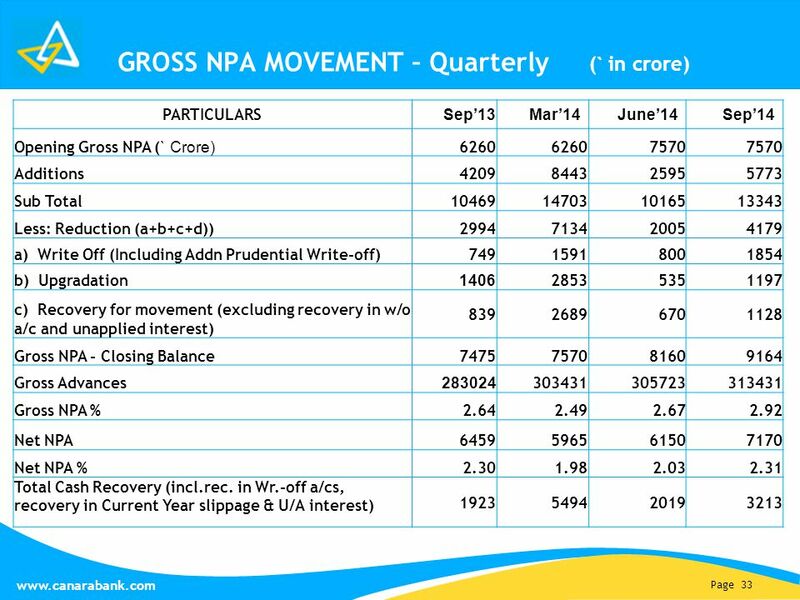 REFORM PHASE India faced a macro- economic crisis in The economy was growing at a very low rate. 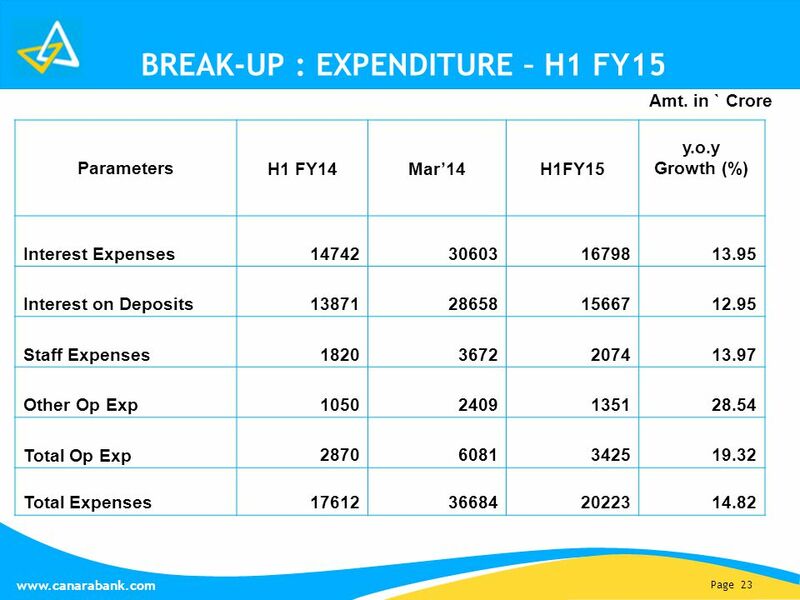 There was a general consensus that the banking. 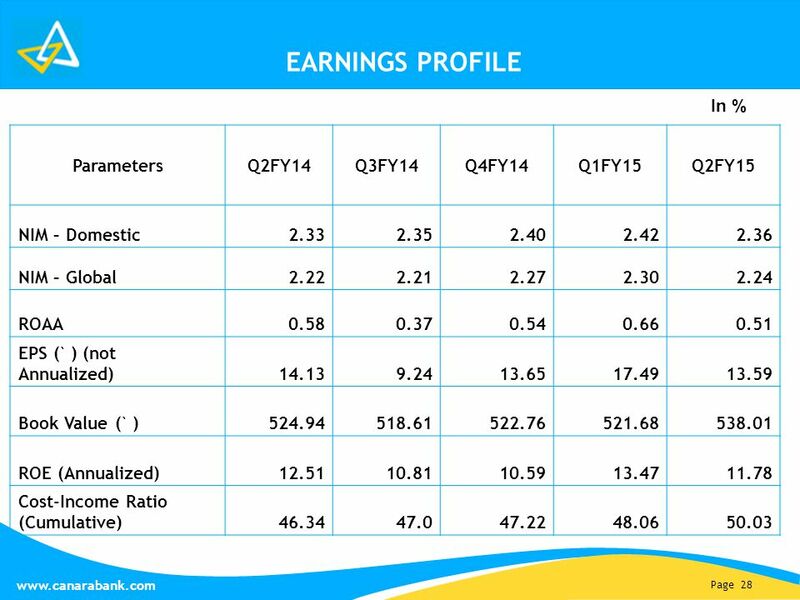 Particulars%age growth Global Deposits 30.08% Global Advances 27.18% CASA Deposits 15.90% Operating Profit 19.39% Net Profit 8.98% Net Interest Income. 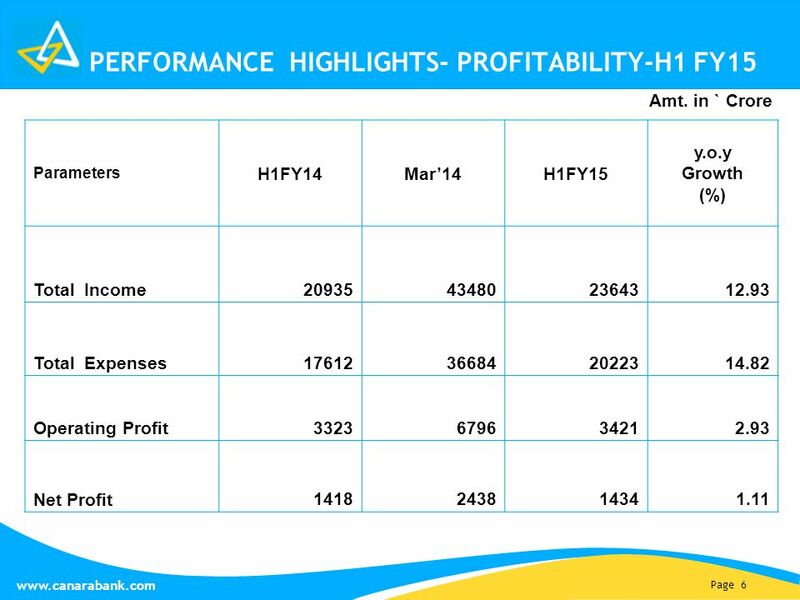 Page 1 PERFORMANCE HIGHLIGHTS MARCH 2014. 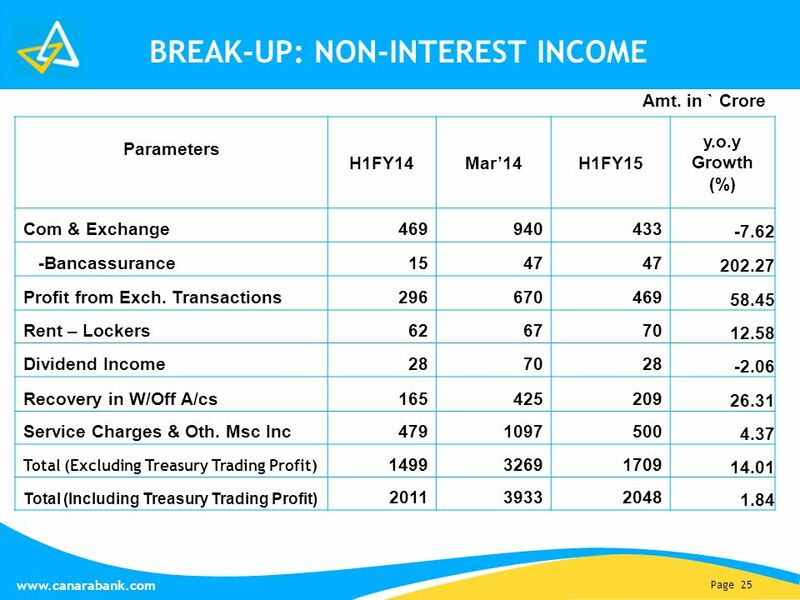 1 GFNORTE 1Q09 Results Conference Call April 30, 2009. 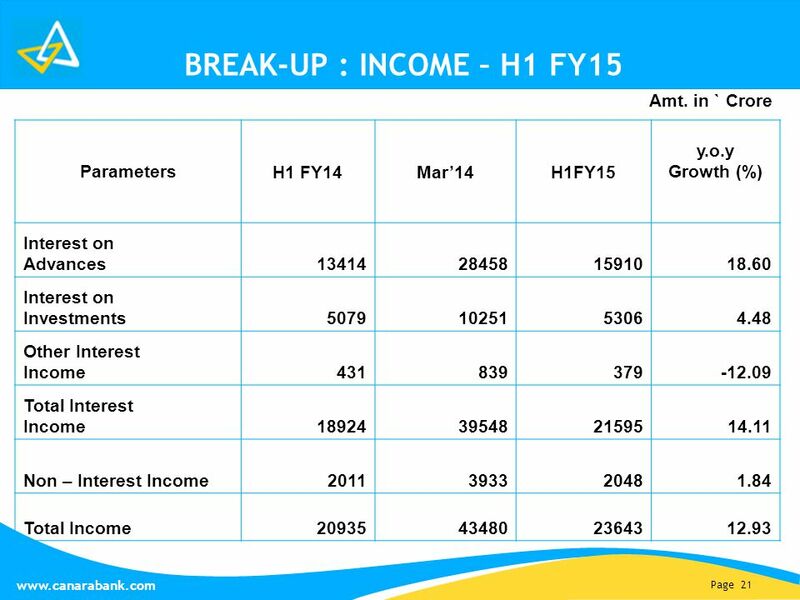 1 FINANCIAL RESULTS FOR THE HALF YEAR ENDED 30 TH SEPTEMBER ANALYST PRESENTATION LOTUS SUITE, HOTEL TRIDENT. 6 TH November 2009. 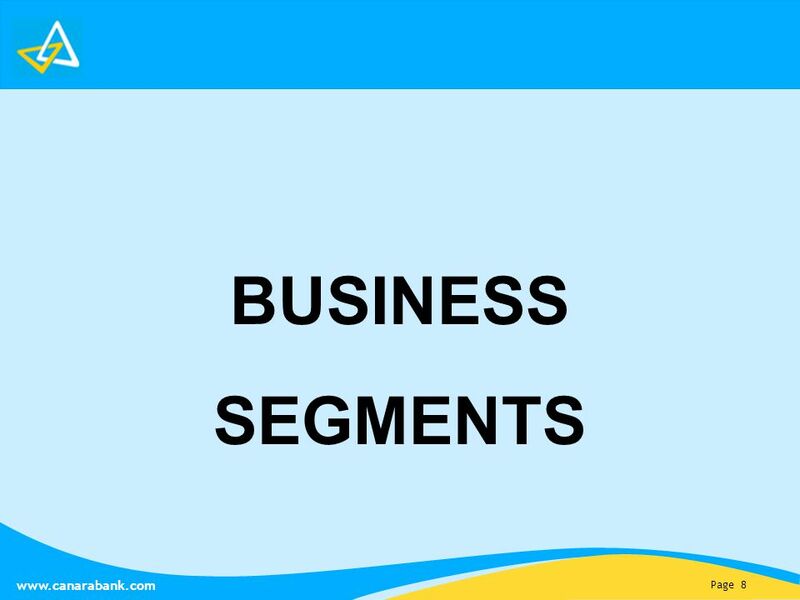 POWER POINT TEMPLATE Company's new low-cost and easy-to-use Web-site design tool will help entrepreneurs spiff up their online. 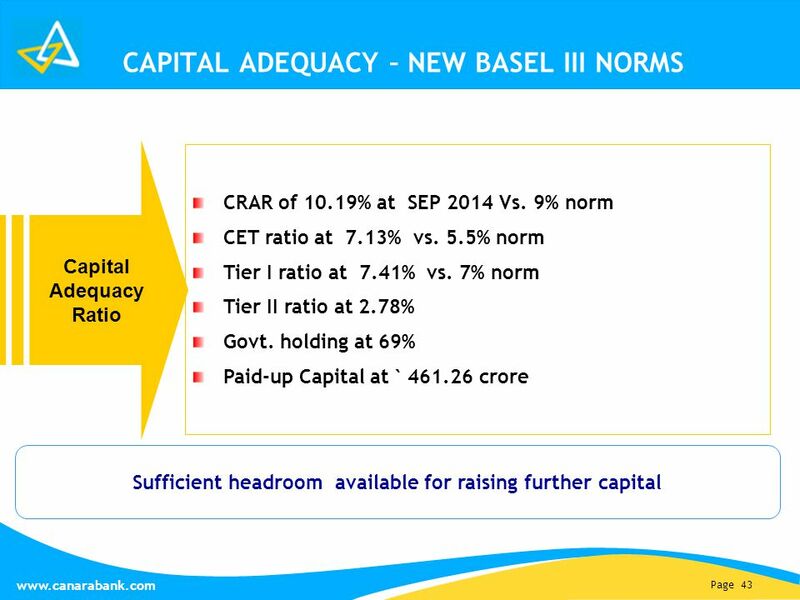 % CENTRAL BANK OF INDIA. 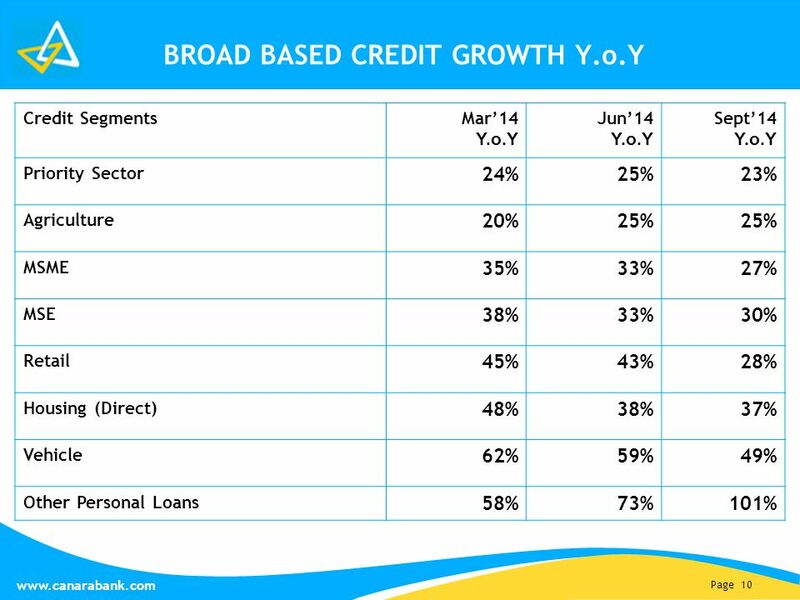 Relationship beyond banking 1. 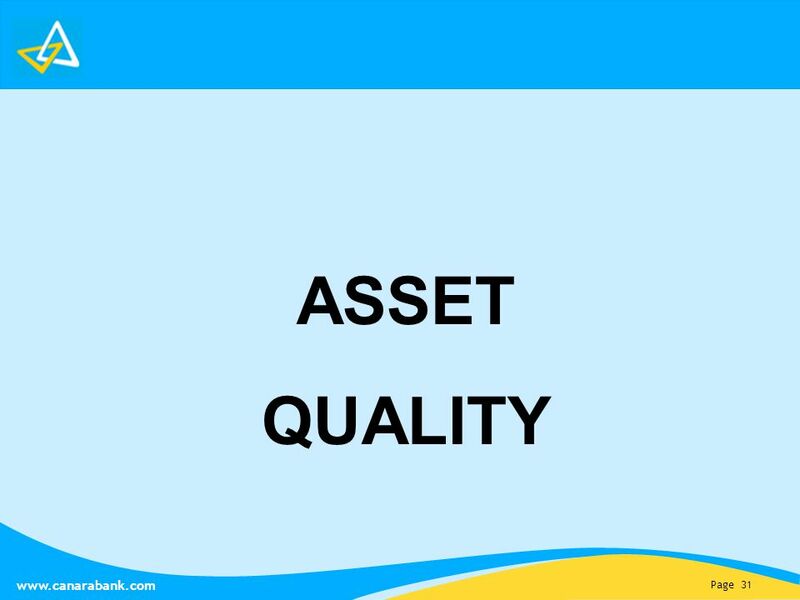 3 Awards & AccoladesAwards & Accolades 4. Performance Review: H1-FY02 October 25, 2001. 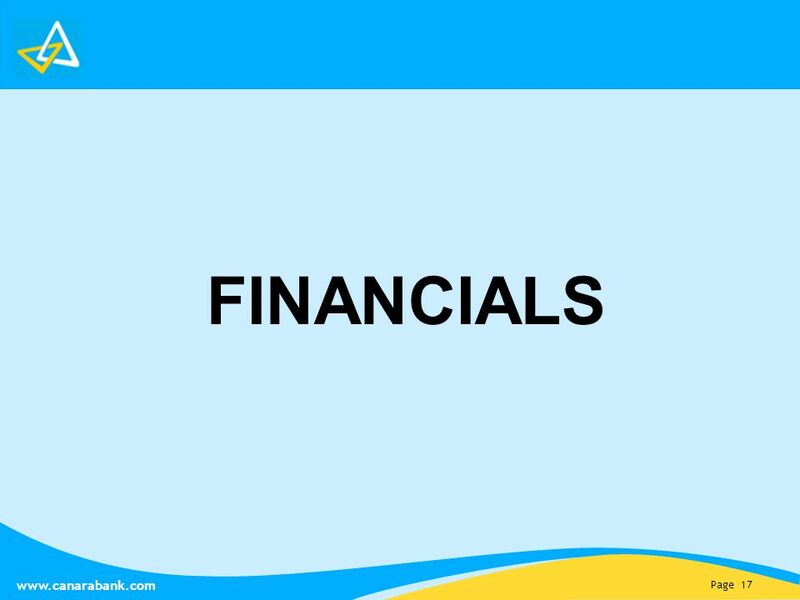 2 Agenda Financial Overview Business Highlights.